I invited the Student Leadership Council for lunch last week in the President’s Dining Room. They are an impressive group and I was glad for the opportunity to dialog with them about the year ahead. Each of these students is uniquely gifted, with a vision and commitment to their assignment. These are students who are serious about making Belhaven a better place, strengthening our student’s college experience, and honoring God in all they do. This is unlike the traditional “Student Council” where students represent a class or sector of the campus (usually spending most of the year ineffectively finding some common ground in order to get something done.) The Leadership structure our students have developed through the past decade is focused on outcomes, and this group hit the ground running on day one with a full agenda. Together they coordinate a comprehensive focus for student initiated activities and priorities. As Student Coordinator of Activities, Katelyn works closely with the Coordinator of Student Leadership & Activities in planning and implementing the College activities program. She also serves as the student leader of the Belhaven Activities Team (BAT). Have student activity questions or ideas? Want to serve on BAT? 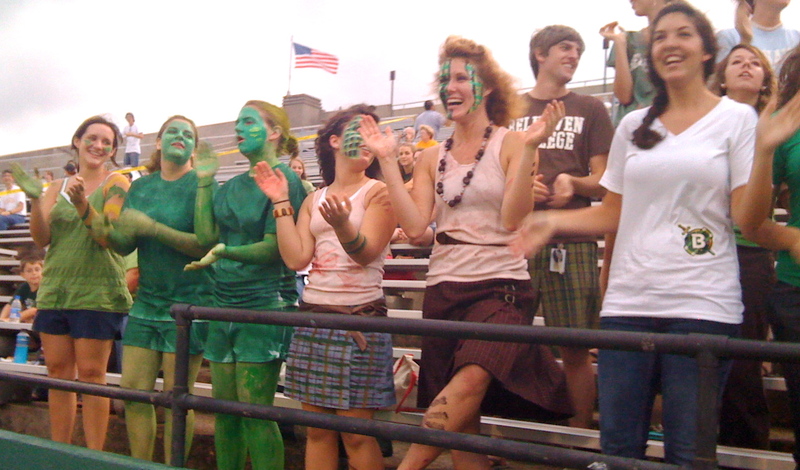 Contact Katelyn at studentactivities@belhaven.edu. As Student Ministry Coordinator, Sergei networks with campus ministry organizations and offers ministry-related events and services for the student body. He can help you connect with a group who will encourage your walk with Christ. Want to find out what ministry organizations are available to you at Belhaven? Want to come together with fellow students in prayer? Contact Sergei at studentministries@belhaven.edu. As the White Columns Editor, Michelle is responsible for the creation and production of the College yearbook. She works with a student staff to create, write, edit, format and produce this lasting record of the Belhaven College school year. Do you take quality pictures? Have computer design, graphics or layout skills? Contact Michelle at whitecolumns@belhaven.edu. As Community Outreach Coordinator, Jerry creates, organizes and implements community outreach projects for student groups of all sizes. He is connected with local service opportunities and offers a broad range of options for students wanting to impact the lives of others. Want to roll up your sleeves and help others? Contact Jerry at communityoutreach@belhaven.edu. As Campus Life Coordinator, Stanton aggressively listens to students’ needs, observations and questions. He meets regularly with the Dean of Student Life and other College administrators to discuss issues related to areas such as residence life, food services and student center services. Have campus life questions? Contact Stanton at campuslife@belhaven.edu. As BLC President, Brandon is the chief student body representative. He coordinates all BLC work and represents students in a host of formal and informal settings. He also works closely with the Director of Student Leadership, and regularly dialogues with other College administrators and faculty. Have questions about BLC – who they are – what they’re doing- how you can be involved? Contact Brandon at blcpresident@belhaven.edu. As Student Coordinator of Intramurals, Andrew works closely with the Coordinator of Student Leadership & Intramurals in planning and implementing the College intramural program. Have intramural questions? Want to play a team or individual sport? Want to work as an official or scorekeeper (trained and compensated)? 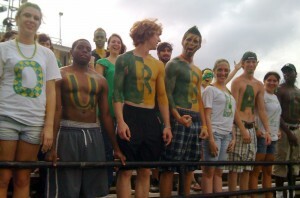 Contact Andrew at intramurals@belhaven.edu. As Editor of The Quarter Tone, Kevin is responsible for the production of each issue of the student newspaper. He works with a sizeable staff of students who create, write, edit, format and produce each issue. Want to write? Have computer or graphic skills? Want to suggest an idea for newspaper coverage? Contact Kevin at quartertone@belhaven.edu. Our students and faculty continue to battle the aftermath of the storm – long lines for gas, food, and everything else. Many have power back on, but about as many continue to be without power. Our Admissions Director, Christine Williams lost her house, as did one student we know of so far. There may be other resports yet to come. To help all on the Houston campus, we will not reopen on Monday as planned, but will continue the closure through Wednesday, September, 24th. We will be open for classes and administrative functions beginning on Thursday next week. Our classroom building there is fine, and power is expected to be restored today. I examine the problems associated both with various forms of protectionism, as well as with the “Fair Trade” movement. I promote free trade, bounded by a biblical morality, as the best option. I show the broad benefits of free trade: improvements in wealth, education, health, and even greater freedom of ideas, including the spread of the gospel. I provide numerous references as well as empirical evidence to support my positions. Part of the significance of this presentation is that many of the faculty attending are libertarian, and don’t seem to understand or appreciate a biblical ethic for all of life. Others attending tend to adopt a soft socialism as representing a biblical view of mercy. I try to address both positions from a biblical perspective. I just received a phone call from Chase Crawford with Granite building management. Here is a summary of what he said. There appears to be no structural damage whatsoever to the Belhaven – Houston offices or classroom suite. There is some damage on the second and third floors of the building including a few broken-in windows. As you know, we only occupy parts of the first floor. He said that there is still no running water or electricity in the building, but that they are striving to officially reopen the building with all of these services by tomorrow @ noon. I told him that we would not be there again until next Monday 9/22/08. I have been watching weather and traffic conditions online via Houston news stations. They indicate that traffic is heavy in-bound with those who are trying to reenter the city and outbound both with normal and some who are still striving to evacuate as electricity in some areas may not be restored within 2 – 3 weeks. Much of the city still has no power. Houston city officials are indicating that they are trying to work from the west side of the city (where our campus is located) then to the east in their electricity repair efforts as there are greater quantities of individuals on the west side. I have relatives in Katy, which is near our campus who have had electricity since yesterday, but others in the same area have no electricity. People near my home in the middle of the city indicate that electricity is still not restored. Tonight our football team played powerful Millsaps that rolled over Mississippi College last week 42-6. It was a very close game going into the fourth quarter. Then their punter used the hurricane generated winds blowing from Texas for a 77 yard kick, followed by our fumble near their goal line and that took all the fight out of us. The final score was 14 – 34. I was proud of our team and they played well and with class in a very emotional game. Along with a big crowd for the game, tonight was a special night with our new marching band taking the half-time field for the first time. This was something we’ve worked toward for years, and to see Dr. Paxton Girtman, lead the Belhaven Band From Blazerland onto the field was thrilling to me. Made me feel like the first time I saw our football team on the field 11 years ago. 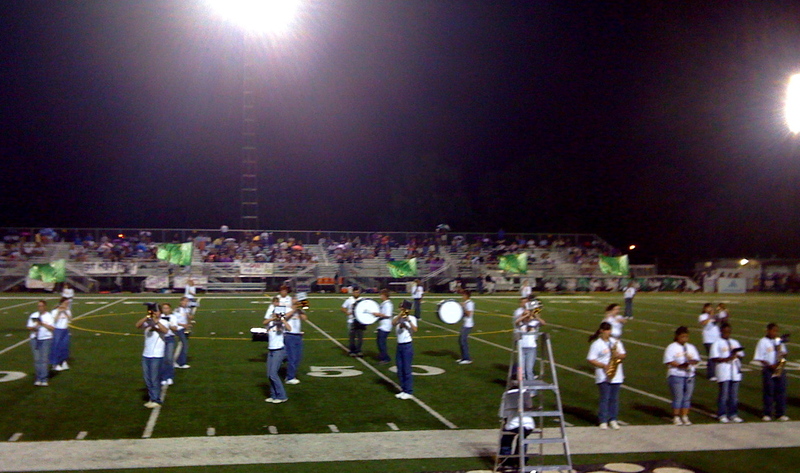 Here is the first picture of our marching band (notice the flag team too) – blue jeans and tee shirts for uniforms for now, but just wait….. I did the coin toss to get the game started so was down on the field and took some pictures of students getting ready for kickoff. 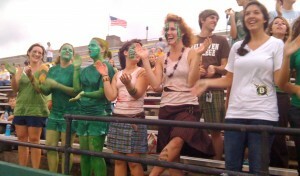 Students came painted up with lots of school spirit. It was a great night. Christine Williams, our Director of Admissions in Houston, left a message on my cell phone this afternoon saying that she was safe, but that her family, along with nearly everyone else in the city, was without power. Reports are that 2 to 4 million people have lost power and it could take over two weeks to restore the entire city. Christine was attempting to call the other staff and faculty to check on damage, but it has been difficult to connect cell calls. The police have asked people to to keep the roads clear for emergency vehicles and only travel if necessary. Our students, faculty, and staff in Houston can’t read this, because they have no power. But you can, so I trust you’ll continue to pray for them. (PHOENIX, AZ) September 12, 2008 – After every major disaster, willing and helpful Christians respond from the heart, but not always with their head. To help our students in Houston plan and prepare for the aftermath of Hurricane Ike, we will keep the Houston campus closed through all of next week. Our students, faculty, and staff need to focus on their family needs during this time of challenge. Our prayers are with the Belhaven family in Houston – and all the people of Houston and the coast who are bracing for the massive storm to come in these next few hours. I know that lots of people pray regularly for Belhaven College. I often hear from alumni, friends, faculty, staff, parents, and students who tell me they are supporting us all in prayer. I receive the following encouraging email yesterday. What a wonderful gift this is to Belhaven, and the other schools, to have these friends pray for us. Today I saw two ladies looking at the Legacy of Learning plaques on the sidewalk. I thought they must be alums, looking at the names of their old professors. But they were prayer walkers, praying the Bible passages on the plaques over the campus. They come here every year on seven consecutive weeks, to pray for God’s blessing on the campus. They go to Millsaps also, the same days. Then they go seven weeks to Hinds, then seven weeks to MC. This is not a program of their churches, but something God laid on their hearts to do. I was encouraged by that, and know you will be also. Hurricane Ike has taken a northerly turn and is headed directly for Houston. BELHAVEN’S CAMPUS IN HOUSTON WILL BE CLOSED IMMEDIATELY, AND WILL REMAIN CLOSED THROUGH MONDAY NIGHT’S CLASSES. ADMINISTRATIVE OFFICES WILL BE CLOSED THROUGH MONDAY AS WELL. Students, faculty, and staff, should check our web site here to see if that closing will be extended. As of this time, we expect to be open again on Tuesday next week. The City of Houston will be closed tomorrow. The Mayor has requested that all Houston schools announce that they will be closed Friday. Judge Emmet with the contra flow plan has called for a mandatory evacuation in several areas of Houston with the following zip codes: 77058, 77059, 77062, 77520, 77526, 77545, 7571, 775856, and 77598. All of us who will not be impacted by this storm need to be praying for those in its path. May the Lord give them the wisdom to evacuate, and provide safety in their travel, and calm in their uncertainty. This is a big storm. The path of Ike can be followed here. If you’re interested in knowing more about The Mail Box Club ministry and John Mark Eagar, our chapel speaker today- their web site is here. More than half of the world’s population is children. Less than 15% of the Churches’ resources go to reaching children. Most of the people who come to Christ do so as a child. Children are also the most neglected population of the world.